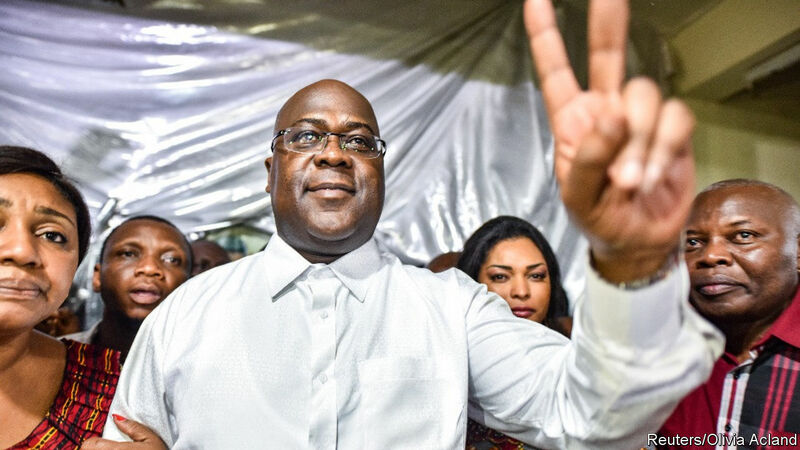 Kinshasa (Agenzia Fides) - On the night between 9 and 10 January the Independent National Electoral Commission (CENI) declared Félix Tshisekedi the winner of the Congolese presidential elections on 30 December. He obtained just over 7 million votes (38.57℅) against Martin Fayulu Madidi (who obtained 34.83% of the votes cast) and the candidate of the outgoing President's party, Joseph Kabila, Emmanuel Ramazani Shadary who obtained 23.84%. Félix Tshisekedi is the son of the historic Congolese opponent, Étienne Tshisekedi, who died in Brussels on 1 February 2017 (see Fides, 2/2/2017). His victory, however, was immediately contested by the other main opposition candidate, Martin Fayulu Madidi, who states that the results have been manipulated. "This result has nothing to do with the truth in the polls", said Fayulu, who denounced fraud on behalf of CENI. "The people of Congo have been defrauded of their elections and will never accept such fraud". While supporters of Tshisekedi poured into the streets to celebrate the victory of their candidate in the capital, Kinshasa, in Lubumbashi, Mbuji-Mayi and Kananga, instead in Kisangani, in the north-east of the Democratic Republic of Congo, supporters of Fayulu clashed with the police who dispersed an unauthorized demonstration with tear gas.